PILIPSON Zhanna, Doctor EMC. Make an appointment, ask a question. She graduated from the Moscow State University of Medicine and Dentistry named after A. I. Evdokimov with a degree in General Medicine in 2016. 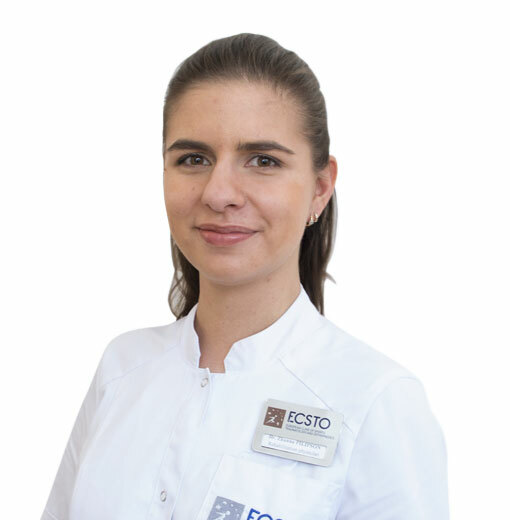 She completed her residency with a degree in physical therapy and sports medicine at the Department of medical rehabilitation of the Moscow State University of Medicine and Dentistry named after A. I. Evdokimov in 2018. She passed training at the Warsaw Medical University (Warsaw, Poland) at the University Center of women’s and newborns’ health. Functional training using Fluiball. Fluiball and rehabilitation at the FLUITRAINING International Academy.